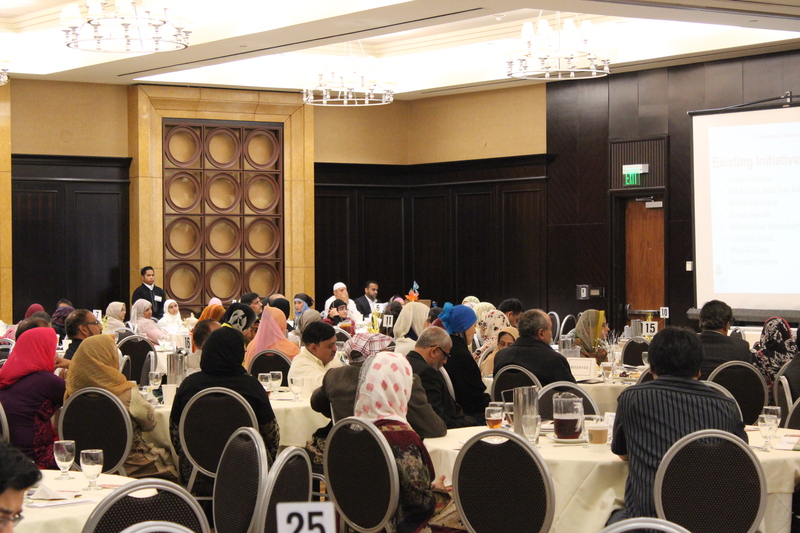 On Sunday, May 10th, 2015, the ICNA (Islamic Circle of North America) GLA (Greater Los Angeles) Unit organized its 10th annual fundraising banquet. By the grace of the Almighty Allah (swt) the event succeeded in raising awareness and was able to collect funds to support its work. Key projects such as WhyIslam, ICNA Relief and ILF were highlighted during the evening. These projects helps in bringing the message of Islam to people of southern California. Sunday's banquet brought together religious scholars and community leaders who spoke and raised awareness about spreading the word of Islam and the importance of not only educating ourselves – the Muslim Community, but also helping others learn the truth about our Deen. Speakers included youth activist Br. Malek Bendelhoum, community activist Imam Jihad Saafir,Sameer Sheikh, the ICNA Greater LA Chapter Dawah Chair, Salman Syed, ICNA Greater LA President and Shaykh Monzer Taleb from Dallas. The keynote speaker was Br. Idris Tawfiq from the UK, a revert to Islam, and former Roma Catholic Priest trained at the Vatican. Due to certain visa issues he broadcasted his inspiring message live to the audience, followed by a a Question & Answer session. We thank all our supporters and volunteers for bringing up a quality event to support the work of Allah (SWT) in this area and we request all of you to remember us in your prayer and support our work.